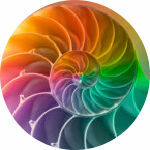 This is a new project developed by leading mathematics educators. 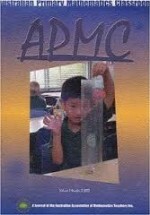 You can access quick targeted maths assessments to reveal your students thinking at www.smartvic.com. The suggested age group is Years 7, 8 and 9 but you’ll find the test levels can also fit with the needs of some Year 5 and 6 students too. Read the accompanying article “Getting Smart about Assessment for Learning.” It is still a work in progress but it will keep you up to date with the latest thinking about assessment. Does your school already subscribe to this fantastic journal from AAMT (Australian Association of Mathematics Teachers)? There are 4 issues each year of the Australian Primary Maths Classroom with plenty of practical articles to help you reflect on your primary classroom practice. It is only $60 per year. Or if you are already an AAMT member you get 50% off your yearly subscription. The editors are Linda Marshall and Paul Swan. If you haven’t discovered this website yet, the Worldometers are a fantastic resource for studying large numbers. They continuously update number facts related to populations, births and deaths, the number of cars and bicycles and even the number of mobile phones in the world. You can investigate at the same time each day and ask students to create their own statistical facts, such as “Since yesterday, the world’s population has increased by …” or “There are almost 2 billion google searches made each day”. Are you a member of your local Maths Association? Here’s another great photo to stimulate your students’ thinking about real-life maths. Enya has 2 macaws on her shoulders. Why is this part of our maths resources photographs? How can this be used to promote mathematical thinking? Most of our photographs at first glance don’t shout “Mathematics” to you. Try to leapfrog from the photo to a wide range of mathematical possibilities. This photo could be the start of a class brainstorm. How many macaw species are there in our world today? What is the heaviest macaw species? The lightest? Which macaw species has the longest wing span? In what countries can you find macaws in the wild? What percentage of the earth is this? What is the heaviest macaw species? How far do they fly on average? What territory do they cover? What do they eat? How much do they eat in a week? How many macaws, on average, would you need to balance your own body mass? How many years do they live? What might a model macaw kite look like? Each of these suggestions could be the basis of mathematical research in your classroom. Why did we include this graphic? Although each graphic in itself may not appear too mathematical, let your imagination fly. Challenge your students to create a wide range of possible questions related to each one. Look at this hen. How many different mathematical questions can you record in 1 minute? How many hens can possibly fit in one square metre of a chook pen? Even so, what is the official number of hens allowed per square metre? 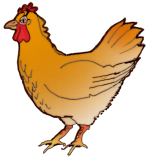 How many eggs does a hen lay on average in one week. How many weeks would it take to lay 2 dozen eggs? How heavy is a hen? Is a rooster just as heavy or heavier? How long does a hen live? How many different breeds of hen are there in our world? What type of hen is the largest? The smallest? How much food does a hen eat in one week? If a farmer has 100 hens, how much food is this in one month? If chook food costs $2.50 per kilo, how much does this cost this farmer for 1 month of chook food? And I am sure there are plenty more questions you can think of! Why did we include this photograph? When you look at each photograph it may not at first be obvious why it can be used for maths. We will leave it up to your imagination in most cases. If you look at this sign, how many different mathematical possibilities do you see? 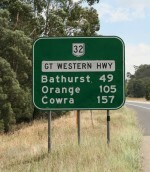 How many kilometres will you travel if you leave Orange and drive to Cowra? Is it further to drive from Bathurst to Orange or from Orange to Cowra? If you start at Bathurst in which direction is Orange? When was each of the 3 towns established? What is the current population of each town? If you keep driving past Cowra, what town will you pass through next? How far from Cowra is this town? Where does Highway 33 go to and from? What about Highway 31? About where would you be if you are 49 km from Bathurst? What other challenges can you create using this photograph as the stimulus? Where to now with subtraction? Bev wrote this article many years ago when she discovered so many students continued to find subtraction difficult to tackle even at the end of Year 6. It seems to boil down to 6 key issues that all schools need to consider. In another life, Bev has been painting in her studio, The Gilded Image, since 1996, specialising in medieval-style images with gilded backgrounds, inspired by the beauty of gold-leaf and the luminous colours in medieval paintings. She is passionate about creating and recreating images from medieval life in general, archangels and angels in particular. You can also browse through Bev’s non-maths photograph collections with favourite images from across the world. 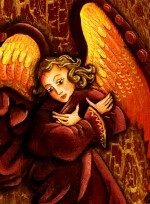 Click here to see examples of her medieval-style paintings at www.thegildedimage.com.